Working with Anglo-Saxon Manuscripts is a highly readable and well-illustrated guide to manuscript study for students and fledgling researchers in Anglo-Saxon history and literature.Bringing together invaluable advice and information from a group of eminent scholars, it aims to develop in the reader an informed and realistic approach to the mechanisms for accessing and handling manuscripts in what may be limited time. In addition to an exploration of the various manuscript resources available in libraries and their research potential, the book appraises recent developments in electronic resources, making it a beneficial aid for teachers as well as individual researchers working away from the location of manuscripts.The book includes a clear and comprehensive guide to palaeography and codicology. Chapters on Old English prose, Old English poetry and Anglo-Latin texts introduce readers to the whole range of written material extant in Anglo-Saxon manuscripts. Manuscript art is uniquely presented in the context of Anglo-Saxon manuscripts as a whole, moving beyond traditional approaches, while the chapter ‘Reading between (and beyond) the lines’ demonstrates some of the fascinating detail of glosses and marginalia, and reveals how the life of the manuscript continued beyond the writing of its main text. A clear, reliable, practical and beautifully illustrated introduction to the subject. The book envisions an audience that ranges from advanced undergraduates all the way to established scholars and even graphic artists, and while the undergraduates have the most to gain from the book, there is something here that everyone can learn from. A common aim of all these chapters is to survey what for many will be recognisable territory, but every chapter embodies original research, and it is inescapably clear that the contributors to this volume have spent a lot of time with manuscripts. The book as a whole contains 115 well-chosen illustrations, many in colour, including a generous number of full-page reproductions from a wide range of Anglo-Saxon manuscripts. The quality of discussion and analysis in every single chapter is uniformly quite high, but it’s the illustrations that will ensure this book’s success as a teaching tool. This is a brilliantly conceived book, and just as brilliantly executed, and it should be required reading for all students of Anglo-Saxon England. The four pages of ‘Further reading’ at the end of the volume are a useful next step for students who have no prior experience with manuscript study. This is a valuable and well-produced book, and I plan to use it the next time I teach a seminar on Anglo-Saxon manuscripts. At a time when the history of the book is flourishing as an academic subject, this collection of introductory papers should find a ready market. The book is generously designed, its pages handsomely laid out, with good use made of wide margins. Each of the eight main chapters has its own introductory page and is equipped with apposite and well-explained illustrations, many in color, and minimalist and non intimidating footnotes. Gale Owen-Crocker is to be congratulated for putting together an interdisciplinary overview that should appeal to teachers and their students in medieval studies more generally. 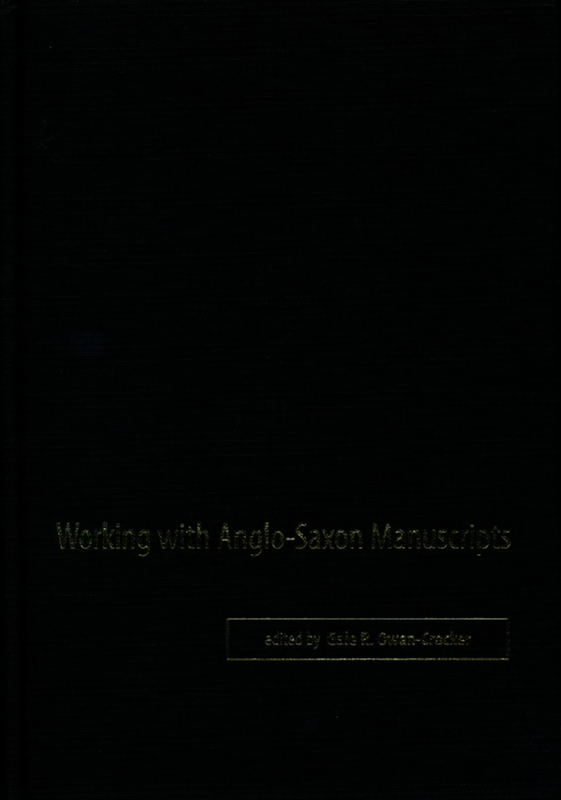 Working with Anglo-Saxon Manuscripts, edited by Gale R. Owen-Crocker, provides a set of beautifully illustrated discussions of key topics which will be of immense use to those starting out in the field. Offers students, teachers, and scholars a valuable research tool. Gale R. Owen-Crocker is Professor of Anglo-Saxon Culture at the University of Manchester. She is editor of Working with Anglo-Saxon Manuscripts (University of Exeter Press, 2009).